So here we are, not even a week into the papacy of Pope Francis, and already people are trying to pigeon hole him and categorize him as a liberal or a conservative. It's interesting enough to see that he is being attacked from both the left and the right. The left, of course, is not happy because the doctrines that they want changed, abortion, contraception, gay marriage, and women priests, are not going to change. I think it's time they realize that whoever the pope is ... the doctrines they want changed won't ever change in the Catholic church. The right, interestingly, is not happy, from what I've seen, because they see Pope Francis as a "liturgical liberal." They see his actions of not wearing red shoes or the mozetta (a red cape) are signs that the pope is some sort of hippy who is going to make our churches look like protestant, with no statues, kneelers or stained glass windows. I think they need to step back and try to see what Pope Francis is doing with his actions . . . in a sense, he is taking the liturgy out to the people. 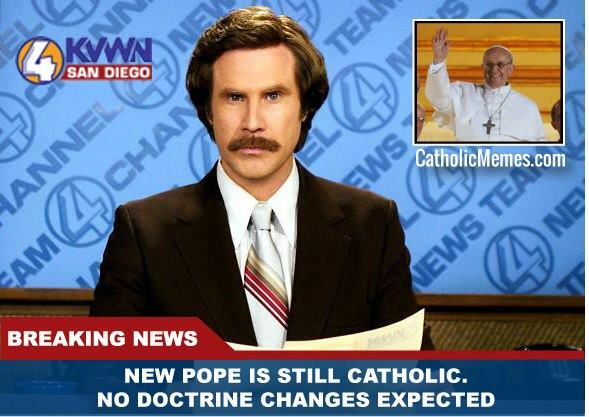 Personally, I love Pope Francis. I trust that the Holy Spirit guided the cardinals and they chose the right man for the job. I think he is doctrinally sound. At the same time. I am a little saddened that he isn't wearing the red shoes and is going away from the pomp that, in my opinion, is due the position of pope. But I can respect that he is trying to remain humble by sticking with a simple white cassock. It is who he is. Here is why I love Pope Francis. I think he is going to challenge people and I believe that your faith should always be challenging you. For those on the left who want doctrinal changes, Pope Francis is going to be truthful and honest--and from what I read, some what blunt. For those on the right, the radical traditionalist, I believe Pope Francis is going to teach by example what it means to truly be Christian. He is going to show them that while the liturgy should be treated with the utmost respect and remain the the source and summit of our faith, it is there to prepare us for the other 23 hours in the day. True evangelazation doesn't happen in a building but happens when we people see Jesus through us. Our faith should always be challenging us. Every time we hear a homily, we should be challenged. If we aren't being challenged then we aren't being driven forward. If we aren't being driven forward then we are stagnant. If we are stagnant, then Satan is able to attack us. Then we are brought down. Only by being challenged and challenging ourselves, do we become spiritually stronger. Only then, when we are spiritually strong, are we able to live our lives according to God's will and only then will we bring others to Christ. Pope Francis is going to challenge us all if we allow him to. He is going to challenge us to believe that all life is sacred and that the family, with the husband and wife as the head of the household, is the foundation of functioning society. He is going to challenge us to better understand our Catholic faith. He is going to challenge us to go out and evangelize by taking care of the sick and the poor. We are going to evangelize the way the early Christians and then, they will know we are Christians by our love.